[This post was first published on the evening of 11 April at the group blogging site Ausvotes 2019, which I have signed up to for the duration]. After confidently calling the end of the 45th Parliament on Thursday 4 April (‘as we head towards the final hours of the 45th Parliament…’), the press gallery was forced to walk back these premature statements of fact within 36 hours (‘Morrison likely to delay election campaign by another week…’). Turns out that ‘sources say next weekend has firmed as the preferred timing’, a prediction from the above article, was also wrong. The ABC News Twitter account posted at 06:37am on Thursday 11 April that Morrison had left the prime ministerial residence to call on the Governor General. And no, this is not a post about political journalism in particular, or major media generally getting it wrong, although I often do write a lot of words [waves hands vaguely] along those lines. Instead, I picked the above example from the last week to illustrate why I want to counter the overload of what we call ‘retail politics’ and ‘horserace reporting’. There is no good reason to report that the parliament is over when the claim has not been verified; or that the election will be called on a specific date – especially when it wasn’t. There is every reason, in contrast, to report on the significance of climate policy stasis which Australia has endured over the last decade and beyond. Intergenerational equity is an internationally accepted principle that has informed global efforts around biodiversity and environmental sustainability at the highest levels since 1972 (United Nations Stockholm Conference on the Human Environment). In more recent years, the principle has been supplemented by intergenerational solidarity and intergenerational justice, not least because we have failed to honour this basic commitment to our children. It is a dismal reality that the current and previous Liberal party prime ministers have used the statement above (correctly ‘declared’ by the last Labor prime minister, Kevin Rudd), to beat up on their political opponents rather than enact meaningful policies on climate change. Since the Coalition government repealed the price on carbon, emissions in Australia have increased every year (charted by Guardian Australia economics writer Greg Jericho here). Australians have the heaviest per capita carbon footprint on the planet. And the UN reports that we are unlikely to meet our obligations to the international community, to intergenerational justice, or to the planet. This is so regardless of whatever comforting lies we are told by the Coalition about reaching our Paris targets ‘in a canter’. If climate change is the moral challenge of our time, the Uluru Statement from the Heart is the moral roadmap to our collective future. Yet after this most gracious of invitations was issued to the non-Indigenous people of Australia, then-prime minister Malcolm Turnbull rejected it. He did this five months later via a press release signed off by then-Attorney General George Brandis and retiring minister for Indigenous Affairs Nigel Scullion. The Voice Treaty Truth movement encapsulates priorities nominated by Aboriginal and Torres Strait Islander Peoples during twelve regional dialogues and the 2017 Uluru Convention. The near-unanimous consensus from these processes is firstly a referendum to amend the Australian Constitution to include an Indigenous Voice to parliament; and then Makaratta, a word gifted by the Yolgnu, meaning ‘coming together after a struggle’. That the Voice be constitutionally entrenched is essential, because past institutional representation of Aboriginal people, such as ATSIC, have been created and abolished by successive governments. That Treaty come before Truth is also essential, because the truth-telling must be led by First Peoples. almost all Australians (95%) believe that ‘it is important for Aboriginal and Torres Strait Islander people to have a say in matters that affect them’ and 80% believe it is important to ‘undertake formal truth telling processes’, with 86% believing it is important to learn about past issues (Karen Mundine, CEO, Reconciliation Australia, 11 February 2019). We are unlikely to hear much about Voice Treaty Truth this election campaign; we typically hear little of First Peoples justice and rights in any timeframe. This does not mean future sovereign relations are moot. Should it win government, the ALP has promised a referendum in its first term. 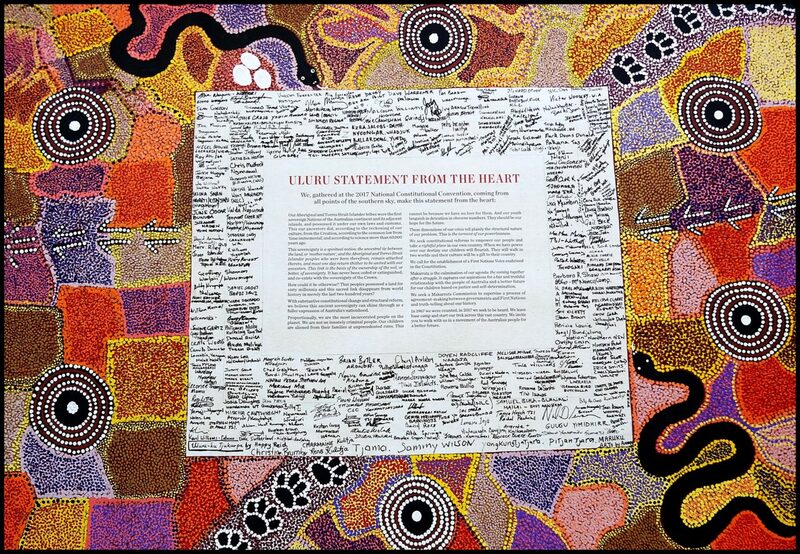 So any reluctance by Labor to campaign on the courage of its convictions is surpassed only by the failure of the Coalition to grasp the import of the Uluru Statement from the Heart at all. Announcing the election date at a press conference at Parliament House in Canberra, Mr Howard said it would be a decision for voters about who they trusted most to look after Australia and its economic future. First, like his other set-pieces – repeating the Turnbull trek to Tumut, re-branding Abbott’s ‘direct action’ (giving public money to big polluters) as a ‘climate solution fund’ (ditto) – Morrison’s catch-cry is copied from a previous Liberal Party prime minister. The notion that this government has out-performed the previous Labor government on the economy does not stand up to the most cursory scrutiny. It is an absurd and dishonest proposition that a record of doubling the national debt, while presiding over growing inequality, exacerbated by falling or at best stagnant real wages, is somehow superior to management of the 2008 GFC so deft we dodged a recession. The Labor economic strategy in 2008, at a time when greedy and destructive neoliberal chickens came home to roost on the watch of a new government, was praised globally, including by no other than Nobel Economics Prize laureate Joseph Stiglitz. For a moment there, everyone was a Keynesian, not that fiscal intelligence has a hope of prevailing in the birthplace of the Murdoch press. Anyway where were we? Oh yes, the unoriginal branding without substance, and marketing rooted in dishonesty, disseminated by Scott Morrison. In my view, this duplicity and intellectual dishonesty goes to character. Actions speak louder than words, so what does this sloganeering tell us about Morrison? That the prime minister has no creative thought or problem solving skills, alongside a complete absence of conscience? As Minister for Immigration and Border Protection he was condemned by the UN Committee Against Torture. As Human Services Minister, as Treasurer, he presided over the most damaging welfare policies of three generations. You have to go back to captain inertia himself, Bob do-nothing Menzies, to find worse treatment of the lowest-income people in our society than by the incumbent. Like most politics-watchers in this country, I am alert to the ‘preferred prime minister’ polling which shows that voters do not warm to Bill Shorten. And to be honest, I do not warm much to Shorten myself. But that does not matter, because it is public leadership that matters. Possibly the worst metric on which the average punter could rely is personal judgements formed by journalists whose duty is to communicate policy choices to the voting public. And that is why I have signed up for Ausvotes2019.